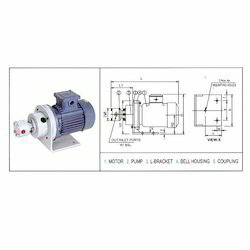 Manufacturer of a wide range of products which include industrial motor pump assembly and rotary pumps. We are offering our clients an extensive range of Industrial Motor Pump Assembly which is manufactured using high-quality raw material sourced from the reliable vendors of the market. Basically, these are three-phased motors coupled with rotary pump. Further, L-bracket is fixed in between the bell housing and pumps of the bolts. In addition to this, the Motor is coupled using star coupling in order to prevent it from twisting, slippage and slackness of two rotating shafts of motors and pumps. We are offering a commendable range of Rotary Pumps to our esteemed clients. Manufactured using high-grade raw material and advance technology in compliance to international quality standards, these products are extensively used in various applications areas. Owing to their excellent performance, superior quality, compact size and longer shelf life, these products are highly demanded by the customers across the country. Sr. No. Description Specification Mat Qty. Looking for Motor Pump Assembly ?